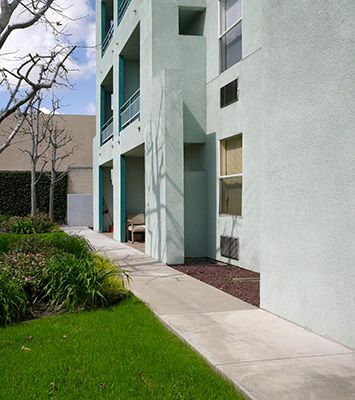 Maywood Manor is a four-story 55-unit complex located in the city of Maywood, just southeast of downtown Los Angeles. Our beautiful building is nestled in a community comprised of many small businesses within walking distance and small family residences. We are also fortunate to be serviced by two Metro Transit Authority bus lines. Maywood Manor Co-op Apartments does not allow smoking in any common areas, and within 25 feet of the building. Maywood is affordable for everyone. Every unit is subsidized and resident members pay only 30% of their income for rent. Resident members enjoy the peace and privacy of their apartments, but also enjoy participating in the frequent community activities. Thanks to our cooperative management style and our resident involvement, our co-op, which was built in 1990, is more beautiful than the day our doors opened. Maywood Manor was also nationally recognized as “A Community of Quality” by the National Affordable Housing Management Association in 2011. Maywood Manor Co-op is proud to be recognized as a NAHMA Communities of Quality Corporate Partner. This designation is for multifamily properties that have achieved a high standard of excellence in the way they are managed, the services they provide residents, the experience and training of personnel, and other criteria.